Darren Shan’s Cirque Du Freak:Allies of the Night is the eighth volume of the Cirque Du Freak series. This book is about a boy named Darren Shan who becomes a vampire in order to save his best friend, Steve Jeopard. The characters are very interesting, the setting is very moody, and the plot is very exciting.Cirque Du Freak is an exciting book that is perfect for teens. First of all, the characters are very interesting. 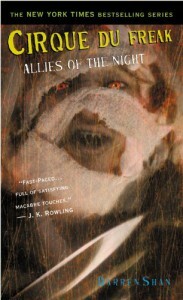 For example, the main character, Darren Shan, was very concerned about his life at first since he became somewhat superhuman and he used to hate Mr.Crepsley, who was the person that turned him into a vampire, but soon he decides to continue his life and decides that Mr.Crepsley was a good person.Another example is Darren’s best friend, Steve Jeopard. He was once fond of Darren but later hates him for he was envious of Darren, then he starts to like him again but in the end he decides to join the evil side. feeling about what is going to happen. Lastly, the plot is very exciting.For example, when Steve threatens to kill his girlfriend, a twist happens when Darren’s allies capture steve, the events make the reader more interested because you never know what is going to happen next. Another event was when Darren battles against the enemy Murlough, the idea of a vampire teen fighting a middle aged vampanese would cause the reader to think “is Darren going to get killed?”the plot keeps the reader reading because of the excitement and twists. Overall, I enjoyed the book Cirque Du Freak and it is a great book that teens should read. The fascinating characters, emotional setting, and thrilling plot already makes it a fantastic book .I would definitely recommends this book to kids from ages 10 and over because it also include many bloody scenes which may affect younger kids. But knowing that it has many elements in which kids are interested in, it would probably be one of the popular books among them.Darren is very dynamic, he changes a lot throughout the book. He started out as a young prince with only a little under standing of his duties. Then he became a noble prince that could see the light even in the darkest of moments. He is a very noble, caring person, and the leadership feel to him. This was when an old rival from the past caught his girlfriend and was going to kill her. Reading strategies than I used were I predicted, previewed, and connected. I thought that the book was Very good it left you wanting more. It was fast paced and full of surprises.